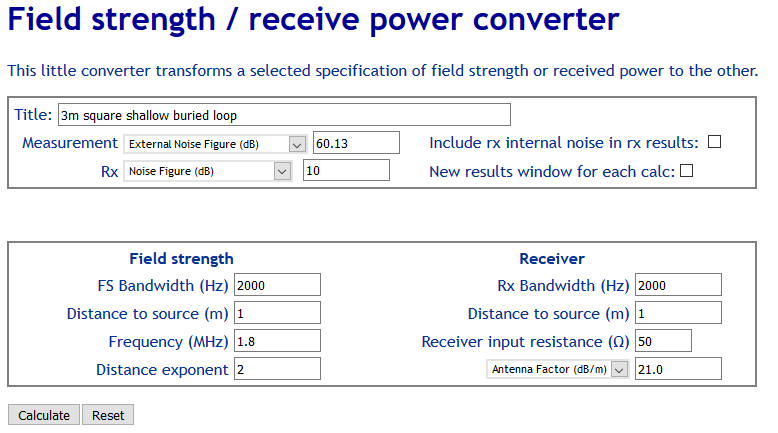 This article documents a feasibility study of a smallish loop on or in ground as a rx only antenna for 160-40m, possibly with advantage in high noise environments. Various ‘on ground’ antennas are discussed online etc, but there is a distinct lack of supporting scientific evidence though subjective anecdotal evidence abounds. 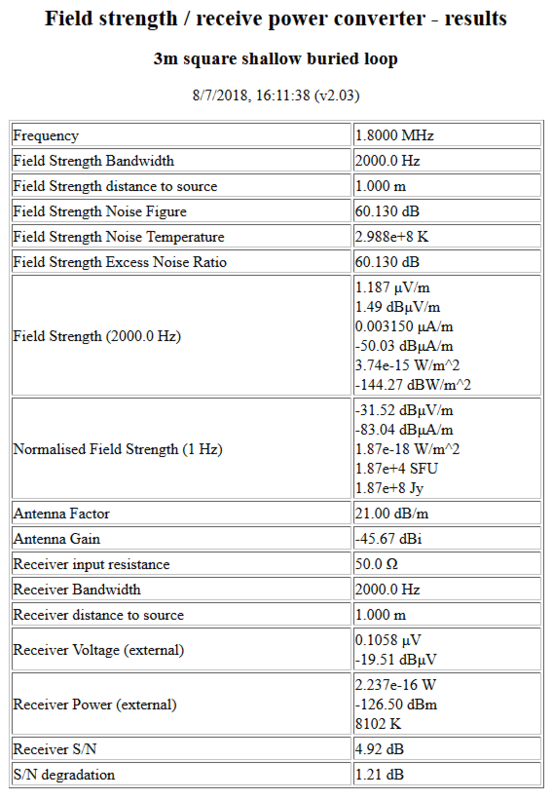 The approach used here is to determine the degradation of S/N resulting from a low gain antenna system in the context of expected ambient noise as per ITU P.372-13. The analysis leans to the conservative side. 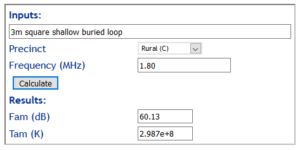 a further 3dB is added to calculated Antenna Factor as a margin for implementation variables (eg soil variation). A series of NEC-4.2 models will be used to explore loops of different sizes mounted just above and just below the ground surface (NEC-4.2 can model buried conductors). 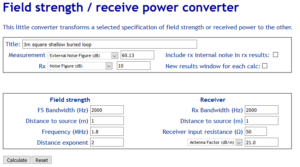 Broadly, models were used to determine the driving point impedance of a small untuned loop just above and just below ground level to hint the impedance matching challenge for a rx only antenna system. Whilst loops above the ground interface appear popular, they create a hazard for mowers and tripping in grassed areas, ant it turns out that although a shallow buried loop itself may have slightly lower gain, it is more than offset by the significantly lower series inductance making for a more efficient simple broadband impedance transformation. Options converged on a 3m square untuned loop buried 20mm in ‘average’ soil, 200Ω load if the middle of one side. When excited by a horizontal plane wave incident at 45° elevation, the current in the loaded segment was found from the model, and load voltage calculated, allowing calculation of Antenna Factor (EField/ReceiverTerminalVoltage). The antenna is well less sensitive to vertical polarisation. Ambient noise for the Rural precinct was found. Note that P.372 makes these predictions based on measurements using a short vertical monopole on ground. The subject loop is less sensitive to vertical polarisation and the P.372 will tend to overestimate the expected noise on the subject antenna. Above, the target Fam is 51.79dB. The choice of a Rural precinct is conservative, Fam for Residential precinct is some 5dB higher. 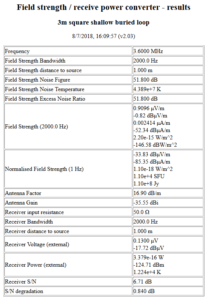 We can then calculate received power level and S/N degradation. Above, the target Fam is 51.79dB. The choice of a Rural precinct is conservative, Fam for Residential precinct is some 6dB higher. A 3m square loop buried 20mm in ‘average’ ground should be sufficient gain for a rx only antenna on 1.8 and 3.6MHz with little S/N degradation. 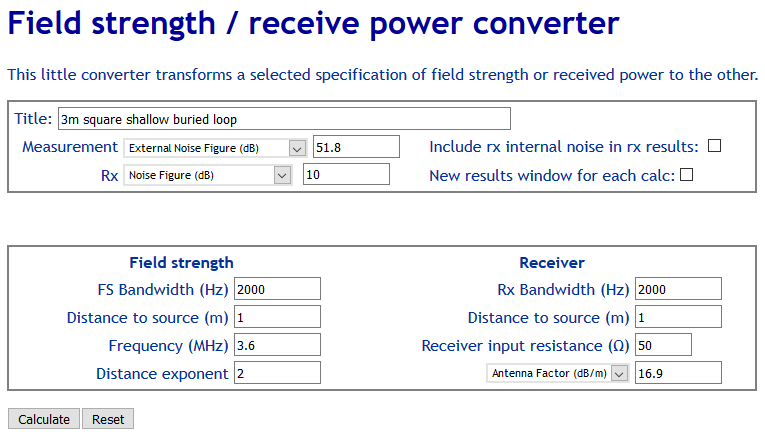 Indeed, carefully implemented to minimise common mode induction via the feed line, and location of the loop away from buildings and power lines, it may provide an effective passive rx antenna in noisy situations.